, an eminent chemist, the son of an apothecary, was born at Zullichau, in the duchy of Crossen, July 11, 1682. Caspar was educated under his father, and commenced practice at Unruhstadt, in Poland; but after a short residence there, he went to Berlin in 1705, and was employed several years as traveller for the pharmaceutic establishment of the king of Prussia. In consequence of the ability which he manifested in the performance of this duty, the king sent him to prosecute his studies at the university of Halle, and subsequently defrayed the expences of a journey, for the purpose of acquiring chemical information. He commenced this chemical tour in 1711 by visiting the mines of Germany and thence went to Holland, where he profited by the instructions of the celebrated Boerhaave. He then visited England, and while here had the misfortune to lose his royal patron, | Frederick I., by death. His talents and character, however, soon afforded him relief from this temporary embarrassment for, on his return to the continent he was detained at Franeker by Cyprianus, who employed him in the execution of many chemical experiments; and he was at the same time invited to Berlin. At that time, however, he preferred accompanying George I., king of England, to Hanover, whither he went in 1716. 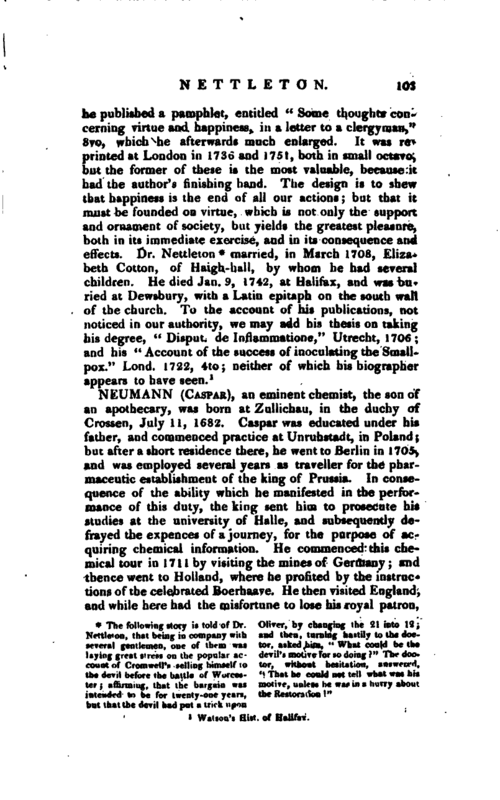 He subsequently visited Berlin, for the purpose of settling some private affairs, where he obtained the friendship of Stahl, through whose influence at court he was again sent on a tour of chemical investigation, through England, France, and Italy, where he was introduced to all the celebrated chemists of the day. 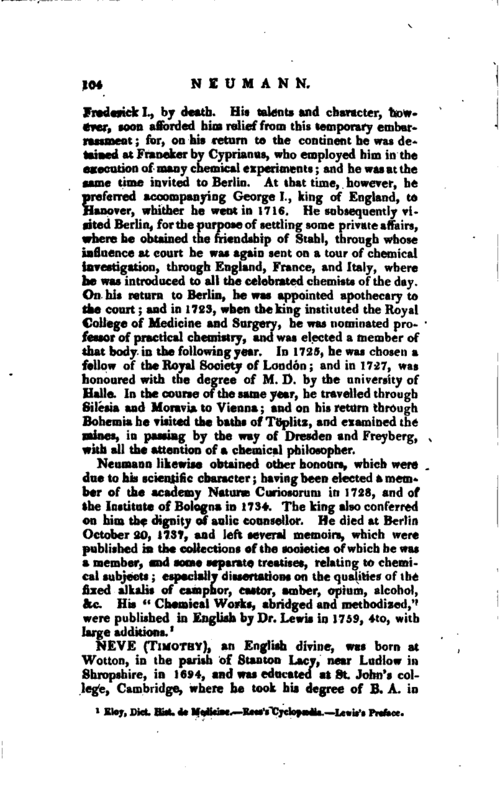 On his return to Berlin, he was appointed apothecary to the court and in 1723, when the king instituted the Royal College of Medicine and Surgery, he was nominated professor of practical chemistry, and was elected a member of that body in the following year. In 1725, he was chosen a fellow of the Royal Society of London; and in 1727, was honoured with the degree of M. D. by the university of Halle. In the course of the same year, he travelled through Silesia and Moravia to Vienna; and on his return through Bohemia he visited the baths of Tb’plitz, and examined the mines, in passing by the way of Dresden and Freyberg, with all the attention of a chemical philosopher. Eloy, —Dict. Hist. de Medicine.—Rees’s Cyclopædia.—Lewis’s Preface.